Your SureTip Crutch & Cane Tips show up in a secure and efficient polybag with brief instructions. Be confident that these crutch tips will outperform your current tips in both comfort and traction. A set of 2 SureTip Crutch & Cane Tips in Black with reinforced bottoms. Innovative tread and rubber material give you a more sure footing even on wet surfaces. Universal fit on shafts from 3/4 Inch to 1 Inch. Ideal fit on shafts of 3/4 Inch to 7/8 Inch. Due to the universal sizing the hole looks small, but the premium grip rubber will flex to fit over your Crutch or Cane. Requires a bit of wiggling and twisting to get to that perfect fit. Safety: While these tips are stable and have great traction on many surfaces, slips can happen. Always test out new surfaces carefully to ensure grip. Use extra caution on wet, oily or smooth floors. Our customers have found great alternative uses for these universal fit crutch tips over the years like - Walker Legs, Chair Legs, Hiking Sticks, Fishing Pole Backside, Umbrella on an Umbrella Table, Shower Rod and more. Let us know how you use them too! Revitalize your crutch with replacement tips from urge medical. Use over time can wear out the tip of your mobility aid, making it unsafe. But an easily installed replacement crutch tip makes it like new! urge tips fit your crutch perfectly. 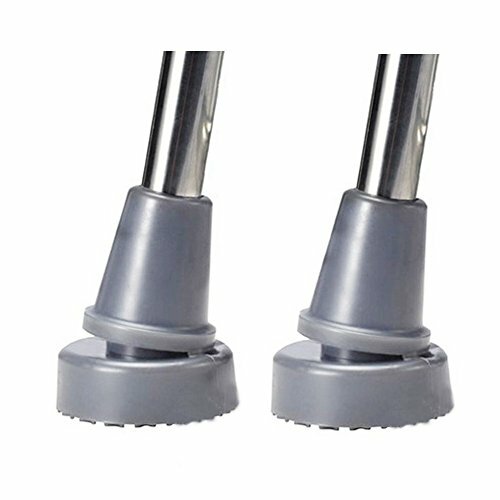 A set of 2 SureTip Crutch & Cane Tips in Gray. Innovative tread and rubber material give you a more sure footing even on wet surfaces. RainGuard (Patent Pending) Our tips fit crutch shafts 3/4 to 7/8 inch in diameter. Why Are RainGuard Better Than Other Tips? RainGuard custom radial design works like a car's tire to help channel the water away. Normal crutch tips with circular rings along the bottom actually trap water under the tip. When you push down, water is forced out between the ground and the ring, thus causing your crutch tips, cane tip or walker tips to hydroplane, significantly increasing your chances of falling. With RainGuard, your crutch tips, cane tip or walker tips always stay in contact with the ground, and the water naturally flows through the channels, away from the tip, and never comes between you and the ground. Great for preventing re-injury after anterior crucial ligament reconstruction surgery. Actual Test Prove They Work! Patty, the creator's wife, is post polio and since the age of four has used Canadian forearm crutches to be mobile. When she married Bob, he saw that Patty had a difficult time on snow and ice. He looked at hundreds of items and ruled out all of them due to "stability", safety and true effectiveness. He then created and began to manufacture Snow Boots. RainGuards came later to make up a complete system to create a slip resistant way for users of crutches, canes and walkers to remain upright. RainGuards and Snow Boots are long wearing and provide the traction you are looking for each day as a user of cane tips, crutch tips and walker tips. RainGuards and SnowBoots are patent pending by Hi-Trac Industries, please don't buy "fake" RainGuards, they are not the true RainGuards. RainGuard fit 3/4 to 7/8 inch crutch, cane shafts. The hole stretches to fit. Sold in pairs. Don't forget to order the SnowBoots for the total System. Brand: TipsThatGrip | Manufacturer: Hi-Trac Industries, Inc.
Thomas Fetterman Tornado SB (Solid Body) Crutch Tips, Fits Crutch Shafts of 3/4 to 1 inch, Gray, Pair: Thomas Fetterman Tornado SB (Solid Body) Tornado Solid Body Crutch Tips are made with high grade rubber for superior flexibility, better ground contact and extremely longer wear. 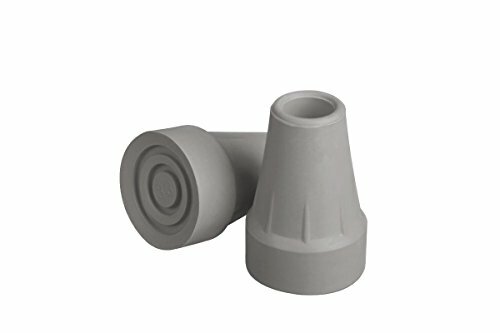 These crutch tips are designed for crutch users who want a tip with great durability at a competitive price. We make them using number one grade natural latex rubber formulated with micronized silica for extreme toughness and wear. Our formula has only 10% clay filler mixed-in versus 40-60% filler with other major brands. Inside the Tornado SB there is a large 1-1/4 inch diameter steel disk that is chemically bonded on both sides to the surrounding rubber body. Because there is no Absorbalite gel inside, the Tornado SB will not protect your shoulders like its famous brother the Tornado GT. However, unlike ordinary tips, our steel disk can not be ejected through the side wall of the tip and cause premature failure. Our Tornado SB tips has a pivoting action that enables more of the bottom of these tips to engage the ground even at steep crutch angles. These tips out-wear ordinary tips 2-3 times over. 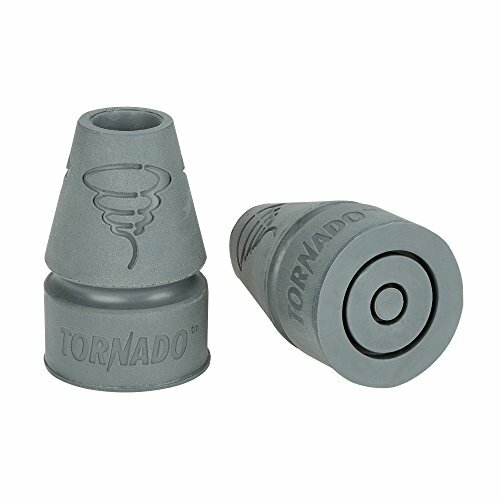 Tornado SB tips have a 2 inch base diameter and weigh 4.4 ounces each. Made in the USA. Sold as a pair. Thomas Fetterman has been using crutches since he contracted polio in 1953. Thomas to set out to build a better solution. He created and patented a shock-absorbing crutch tip that absorbs 80% of negative ground impact force and lasts 3-5 times longer than ordinary tips. And that was just the start. Thirty years later, the company offers a full line of tips, forearm crutches, canes, and grips. All products are made in the USA using top quality components with over 1 million products sold worldwide. From Thomas Fetterman - a leading US manufacturer of mobility products including crutches, tips, canes, and hand grips. All products feature a money-back satisfaction guarantee. Brand: Thomas Fetterman | Manufacturer: Thomas Fetterman Inc. Always a popular choice! Made exclusively for Top Glides these high-quality rubber style tips feature a steel insert for added strength and durability. Thick long-lasting rubber for better grip on floors. Versatile for use indoors and outside. Tip: Make crutches a softer & easier with our Crutch Comfort underarm pads, hand grips, and pouches. All Terrain Stabilizer Crutch Tips make it easy to navigate sand, gravel, soft grass, and snow when using crutches. Innovative stabilizers fit on the bottom of crutches, and its flat bottom keeps you stable on unsteady ground. Also features sand and water drainage vents, and keeps your crutches upright when not in use.Go ahead and take that long walk on the beach with confidence! Each crutch tip weighs less than a pound. Fits all standard 1" diameter. crutch stem sizes. 3" diameter flat surface. 6" diameter pads. Innovative stabilizers fit on the steps of crutches, and its flat bottom keeps you steady on unsteady ground. Also features sand and water drainage vents, and keeps your crutches upright when not in use. Go ahead and take that long walk on the beach with confidence - Each weighs less than a pound! Made in USA. Fits all standard 1 dia. crutch stem sizes. 3 diameter flat surface. 6 diameter pads. Paired packages are for CRUTCH use only. For canes, please order our single pack which includes tape strip adaptors for cane stems less than 1 inch diameter. Large surface area provides superior tracking. Heavy-duty latex-free rubber tip flexes for cushioning and shock absorption. 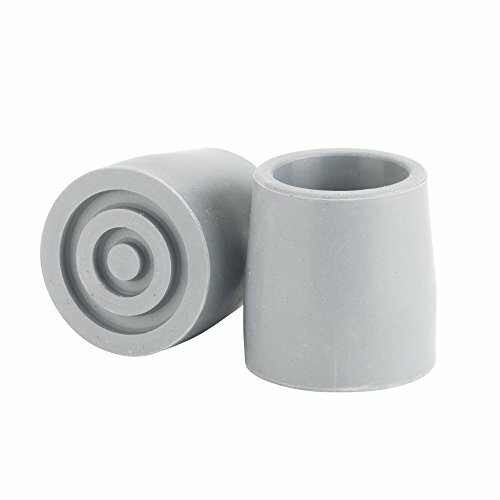 More crutch rubber tips, Please search: ASIN" B07GKFLJQG". They are advanced all-terrain crutch and cane tips for challenging weather conditions provide stability and traction while walking or standing still. Using a cane or crutches is challenging enough. Having to get around in wet and slippery conditions can be a formidable task. Now you can avoid slipping a removable tip that attaches to the bottom of any cane or crutch. They are specially designed tips for canes and crutches that simulates the human ankle joint movements, allowing for greater safety and stability anywhere you need to be. They are made of a durable, anti-slip, medical-grade rubber, with four wings for maintaining balance. 90 days unconditional guarantee so you can purchase now with confidence. Thomas Fetterman Tornado Rain Crutch Tips, Fits Crutch Shafts of 3/4 to 1 Inch, Black, Pair: Thomas Fetterman Tornado RT (Rain Tips) gel filled Rain Tips give you the same shock absorbing qualities, superior flexibility, better ground contact and longer wear as our original Tornado Gel Crutch Tips with improved slip-resistance. 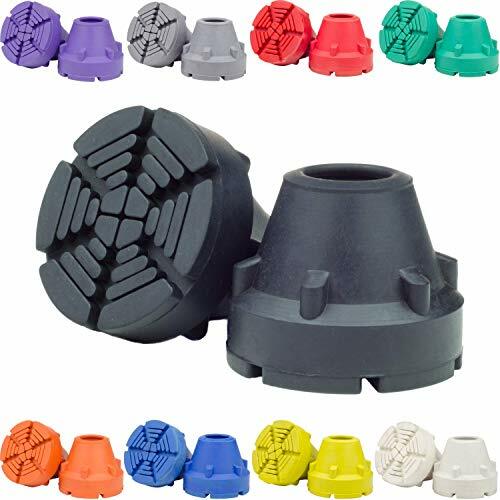 Tornado Rain Crutch Tips have a thick shock absorbing Absorbalite gel core in our Tornado gel tips plus our proprietary slip resistant rain disk tread piece making them over 300% more wet-slip resistant than any rubber tip we have tested. They have excellent traction on dry surfaces as well. 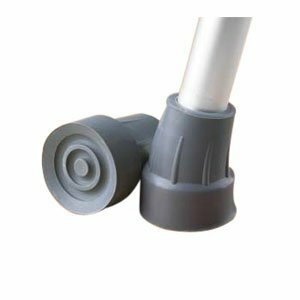 While not slip-proof, Tornado Rain Tips can greatly reduce the number and severity of crutch related falls caused by wet smooth surfaces. If they keep you from falling just once a year, wouldn't they be worth the extra cost? Personally, I won't leave home without them! 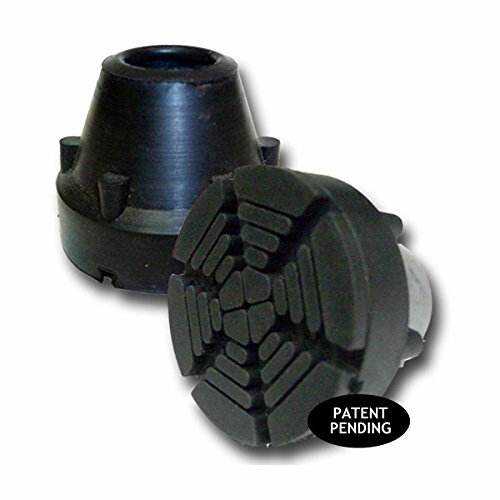 Tornado Rain Tips have a 2" base diameter and weigh 4.6 ounces each. They fit crutch shafts from 3/4" to 1". Black with gray tread. Sold as a pair. Thomas Fetterman has been using crutches since he contracted polio in 1953. As an adult, the shoulder pain and increasing slips and falls caused by his crutches led Thomas to set out to build a better solution. He created and patented a shock-absorbing crutch tip that absorbs 80% of negative ground impact force and lasts 3-5 times longer than ordinary tips. And that was just the start. Thirty years later, the company offers a full line of tips, forearm crutches, canes, and grips. All products are made in the USA using top quality components. With over 1,000,000 products sold, customers agree that we manufacture the most technically advanced, handsome, and durable products available. In fact, just about everyone who has tried them has become a dedicated customer. Why not experience the difference for yourself? ERGOCAP HGH-PERFORMANCE: extremely robust and durable on all types of terrain, supporting heavy loads/weight, and handy for all types of crutches. 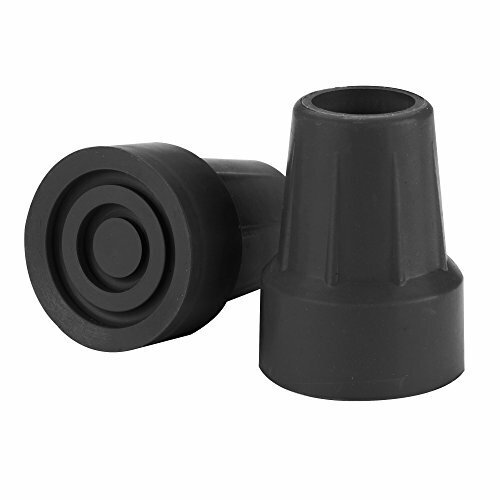 Ergocap High Performance is a Universal, non-slippery crutch rubber tip designed specially for crutches. It is heavier and bigger compared to the Ergocap Ultralite, designed for Canes & Pediatric Crutches. 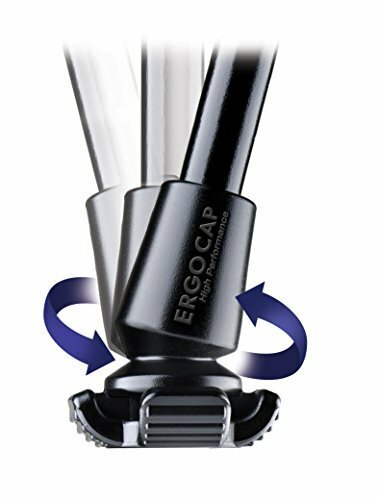 Ergocap High Performance was designed to provide the user with stability & balance at any angle in which it is positioned. Ergocap HP is the only crutch tip in the market that effectively emulates the foot and ankle joints, providing a proper posture while delivering stability at any angle. Contains four anti-slippery ailerons with flaps for balance and support. It also promotes a perfect gait, as it makes the user walk in a HEEL-FLAT-TOE manner, providing a proper posture and reducing unnecessary pain. 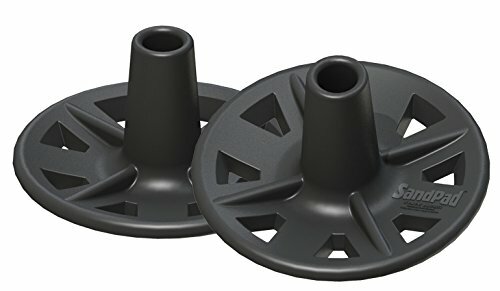 Thomas Fetterman Tornado Gel Crutch Tips, Fits Crutch Shafts of 3/4 to 1 Inch, Black, Pair: Thomas Fetterman Tornado Gel Crutch Tips give you a very comfortable shock absorbing ride that reduces fatigue. They are made with high quality rubber for superior flexibility, better ground contact and longer wear. My patented Tornado Gel Crutch Tips have a thick shock absorbing Absorbalite gel core that absorbs up to 80% of the negative ground impact forces passed up through your crutches into your hands, arms and shoulders with each step we take. 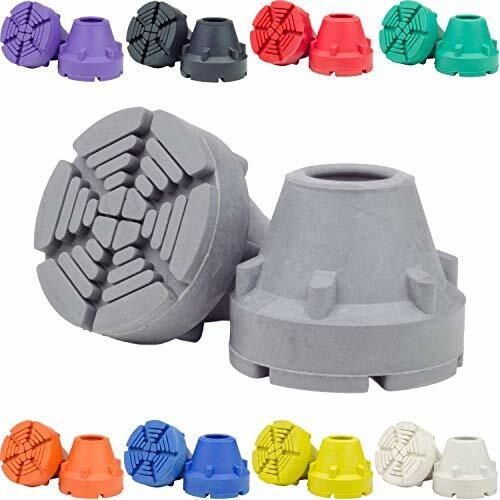 Tornado Gel Tips are hand assembled in a 12 step process using #1 quality natural rubber. Our proprietary formula has only 10% clay filler mixed-in versus 40-60% filler with other major brands. We add micronized silica for durability. Two coats of bonding agent are painted onto the large 1-1/4" diameter steel disk before being molded inside each tip so it stays centered and can't be pushed through the side wall. Tornado Gel Crutch Tip's engineered pivoting action enables more of the bottom to engage the ground for amazing traction, even at very steep crutch angles. 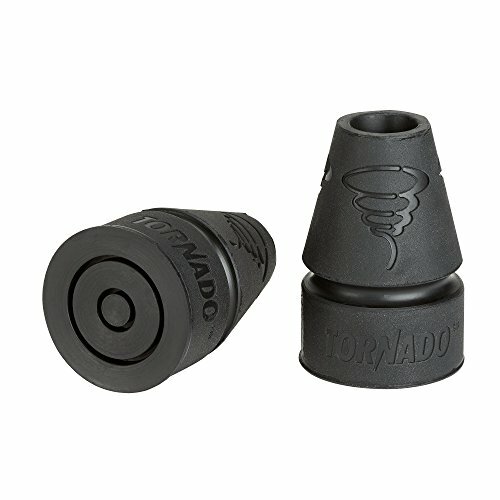 Tornado GT tips have a 2" base diameter and weigh 4.4 ounces each. Tornado Gel Tips tips will out-wear ordinary tips 3-5 times over. Made in the USA. Sold as a pair. Thomas Fetterman has been using crutches since he contracted polio in 1953. Thomas to set out to build a better solution. He created and patented a shock-absorbing crutch tip that absorbs 80% of negative ground impact force and lasts 3-5 times longer than ordinary tips. And that was just the start. Thirty years later, the company offers a full line of tips, forearm crutches, canes, and grips. All products are made in the USA using top quality components. With over 1,000,000 products sold, customers agree that we manufacture the most technically advanced, handsome, and durable products available. Extra padding for under arms and hands. Using crutches can be more comfortable! This crutch tips fits 7/8 inch(22mm)diameter cane. Rubber material and bottom non-slip design. High quality Rubber material is durable in use and wear-proof. Effectively ensure the safety of the user walks. 360 degree swing tips enables you stand stable even if the cane is tilted. There is built-in steel cushion to reinforce the tips. STABLE : Owing to the new design of 360 degree swing tips, it can still be steady even if the crutch is tilted. 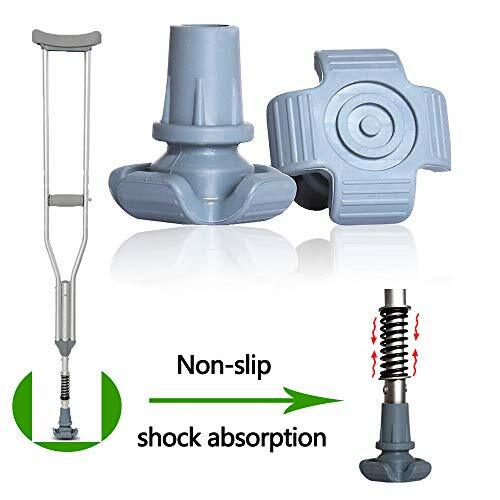 ANTI-SKID AND WEAR-RESISTING : High performance 360 degree swing tips enables you stand stable even if the cane is tilted.. Rubber material and bottom non-slip design. DURABLE : High quality Rubber material is durable in use and wear-proof. UTILITY : Effectively ensure the safety of the user walks. Revitalize your walker or homecare commode with replacement tips from Drive Medical. Use over time can wear out the tip of your home medical device, making it unsafe. Easily installed replacement tips make them like new! Drive tips fit your product perfectly. 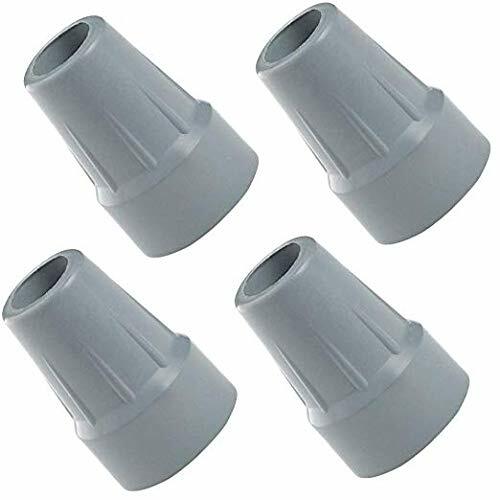 This anti-slip replacement cane tips are accessories of underarm crutch. It made of high quality rubber and are designed to fit perfectly on all standard canes. Choose between sizes 7/8 inch, 3/4" inch, or 1 inch diameter. Safely replaces worn tips on your 7/8" diameter cane. Fit PCP brand cane shafts with Drive cane model's 10315, 10318, 10400, 10401, 10402, 10406, 10408, 10430, 10431, 10432,10433 series. 2 tips in the package. Designed for a snug fit. Easy to install. Function beautifully through any terrain that life may take you. Whether you need to navigate through sand, rain, or snow your MTip crutch tips have the power to get you through wherever you need to go. 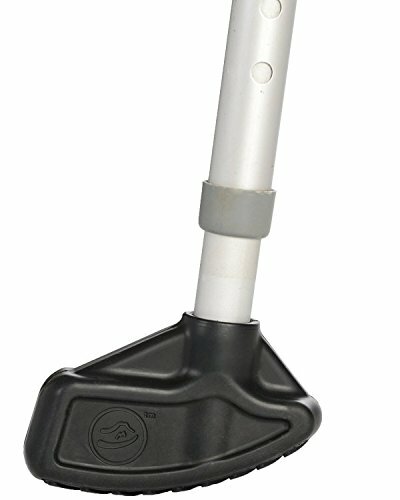 The MTip crutch tip is an enhanced crutch tip designed with superior traction that increases the efficiency, stability, and safety of walking with crutches. With a rolling motion, the MTip crutch tip provides multiple points of traction and allows a crutch user to use their own weight in an assisting motion. We are changing the way people are walking on crutches. The MTip crutch tip was designed , tested , and manufactured with all users in mind. Everyone , whether a long or short-term crutch user, stands to benefit from the MTip crutch tip's assistive and stabilizing forces. The Performance MTip crutch tips are the perfect responsive complement for your on-the-go lifestyle. With a rolling motion, the MTip crutch tip provides constant assistive force by redirecting your own weight. The Performance MTip crutch tips are more dense than the Comfort MTip crutch tips and are truly one of a kind and versatile enough to keep up with the most active lifestyle! Although the MTip crutch tip is traditionally used with the treaded arrows facing forward, switching the MTip crutch tip into its reverse orientation increases the stability and motion control at a user s discretion making walking down stairs and hills easier than ever. 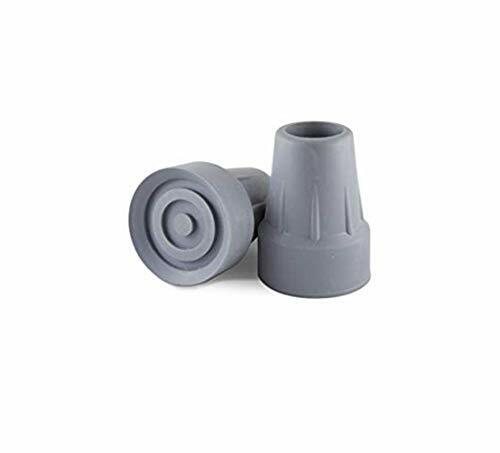 PCP brand anti-slip replacement crutch tips, first quality rubber, designed to fit perfectly on all PCP brand crutches, as well as most other major brands. Available colors: Gray, Tan, Black. Available sizes: Small (3/4 diameter shafts) for child size crutches; Medium (3/4" - 7/8" diameter shafts) for standard adult size crutches; Large (3/4" - 7/8" diameter shafts). Please note Large size denotes an increased footprint with a larger base for increased stability. Large (3/4 - 7/8 diameter shafts). Please note Large size denotes an increased footprint with a larger base for increased stability.